After announcing that they have won silver in the Taste of the West 2011 awards for their champagne truffles, Melchior Chocolates from south Devon sent me a massive box with a bag of their truffles secreted within enough packing to ensure they survived the trip. This is a company that clearly has lots of experience with Royal Mail. 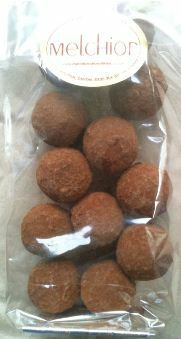 I’m kind of picky about my Marc de Champagne truffles. The ganache tends to be wet, too loose and poorly made. Well, I’m a little confused about why this won silver – the ganache is about as firm as you can make it, the chocolate is delightful and I love the cocoa dusting. Maybe the judges didn’t like cocoa dusting? The chocolate is indistinct – I’m not clear of the quality but it is a very nice dark chocolate. 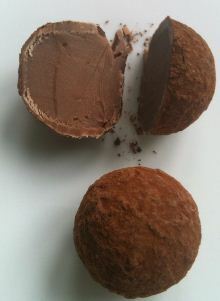 The chocolate itself is a thin shell containing the ganache which has been moulded and filled then capped and coated and rolled in cocoa powder. Or at least that is what it seems from munching my way through most of the bag. It’s been an awfully long time since I enjoyed munching through chocolates and shared with husband. Usually it is a stress to taste them and describe but because I had a bag I was able to actually enjoy these and I have and will continue to do so. Did I like them? Yes. Would I buy them – absolutely. In fact, I’m a bit sad the in-laws have moved because I’d go on my next visit. You can buy some online though or you can visit where the magic happens.